>I had intended to spend Saturday sketching a lot. However, I went out for brunch and then ran some errands. I dropped stuff off for donations and then browsed at Bookmans where I found a nice (old) hardcover book to start sketching in and a few other odds and ends; Value Village (a thrift store) where I found just what I was after: a bag of buttons and some photo frames; then on to Antigone where I found a new Moleskine sketchbook (which I use for a journal). 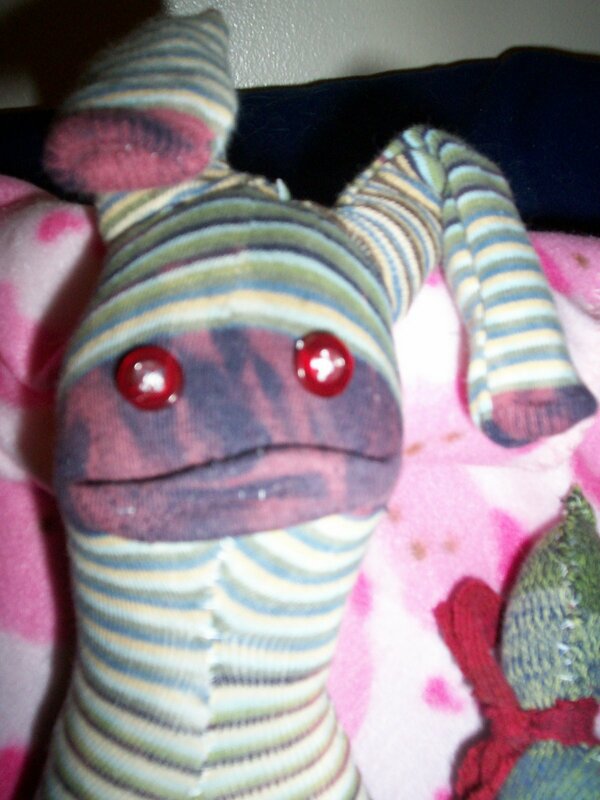 I went home and used some of the socks I rescued from my donation bag and decided to try making a stupid sock creature. Before finishing the first one, However, I had to get some polyester fill. I thought Target might have some, but did end up having to go to Michael’s -where I also found some more micron pens, notecards on sale, knitting needles (cause I want to learn), a thimble (I didn’t have one) and some more buttons. I almost bought one of those tomato pin cushions cause it’s just like the one my mom has and I used to play with it as a kid. 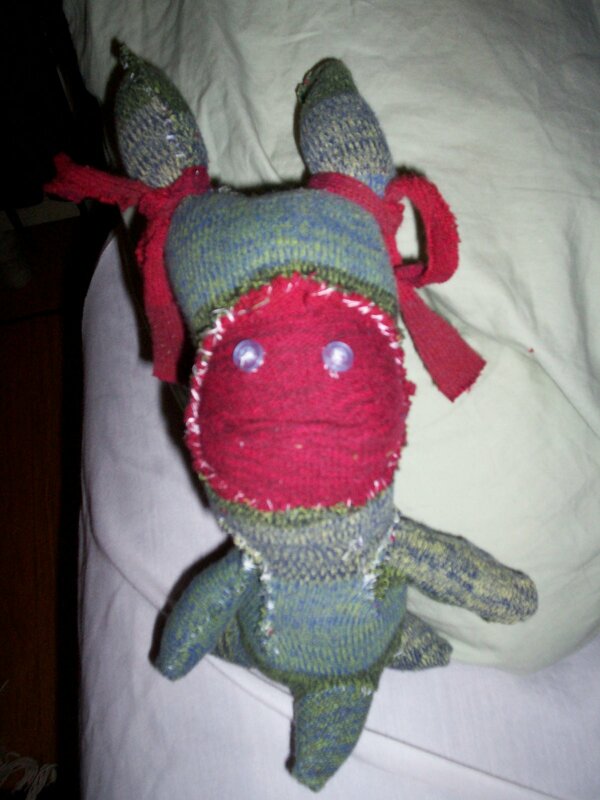 This is Sweetwater, my first attempt at a stupid sock creature. I picked it cause it looked easiest. However, half way through the project I read the intro page on her (her name is Genevieve in the book) and it says: “Genevieve is definitely for the skilled stupid creature maker…” I laughed at myself. That will teach me to read first, do second. It was fun making her, regardless. Meet Rayas (stripes in spanish). He is my second creature. 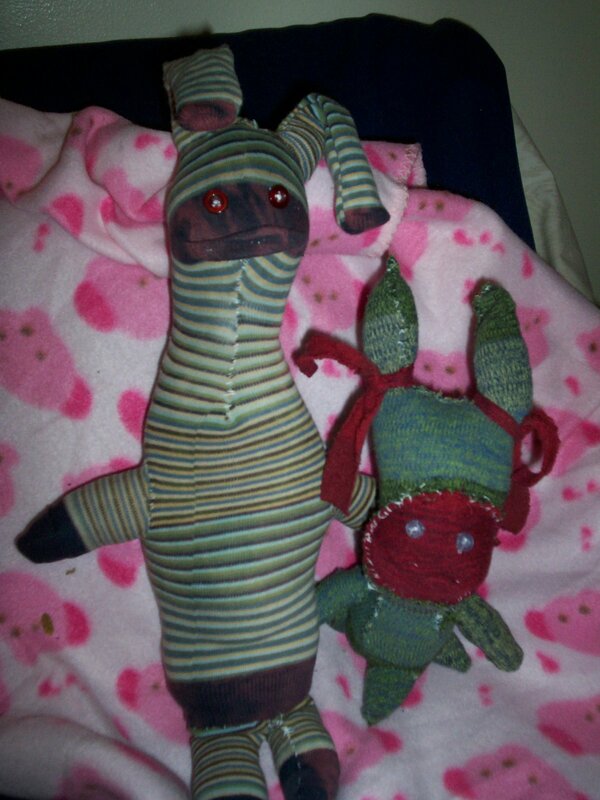 I was so excited to have Sweetwater that I wanted to make her a friend, so I stayed up making this guy. He’s Wronky in the book, but listening to Mana while crafting him made me name him Rayas. 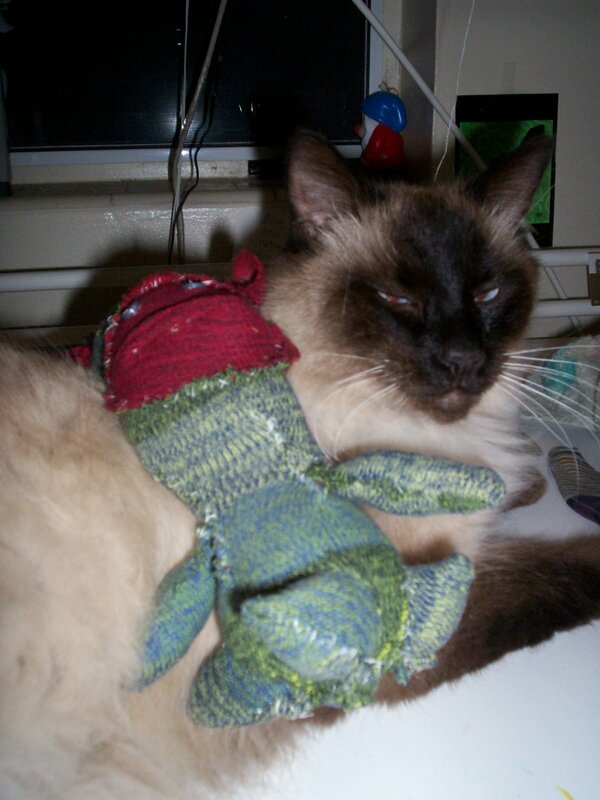 I decided not to stuff his ears and make them dangly instead… You can’t see his body in this pic, but if you scroll down you’ll see a full body shot. I don’t care for his LOooooooooong body…if I did him over again (which I couldn’t, cause they’re all so unique) I’d have made his legs longer than they are. Oh well…I like him anyway! Sagis wasn’t too sure, but Sweetwater won him over. but Rayas’ floppy ears made Sagis a little nervous. 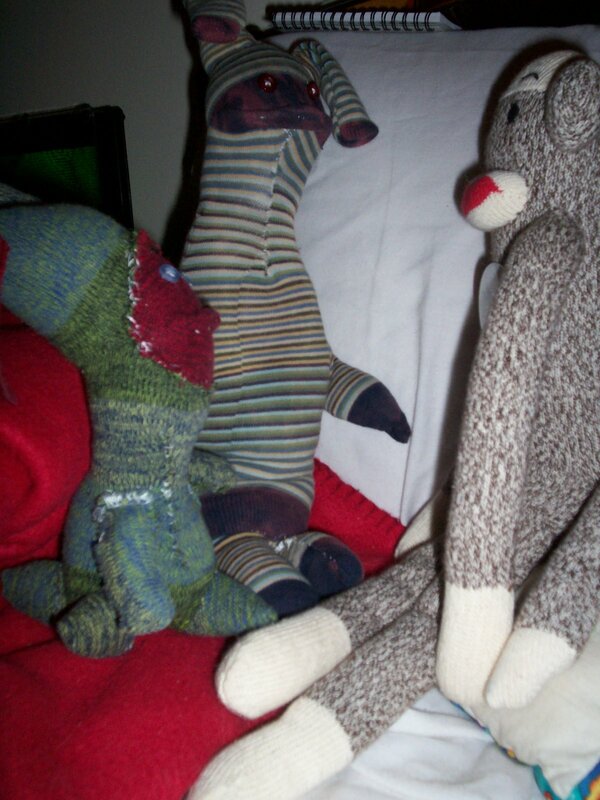 The creatures wanted to get a better look at Sock Monkey…so they had a little pow wow. If I decide to make another one, my plan is to be more creative and not follow a pattern so closely (actually Sweetwater is a deviation from the pattern. Though she has all four feet, she only has 2 arms rather than 4. also, she wasn’t supposed to get a mouth…but I gave her one cause she was mentally crying for one.) but be more creative…we’ll see!!!!!!!!!! 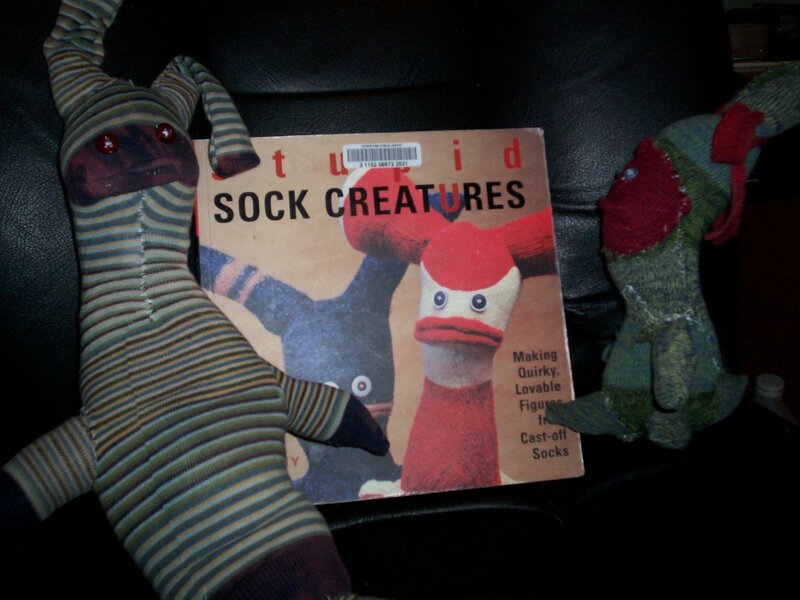 *I checked out John Murphy’s Stupid Sock Creatures from the library. This entry was posted in sagis, tucson by Alanna Randall Beckwith. Bookmark the permalink. >I love your sock creatures! They are very groovy! >I frankly love the creation you have. 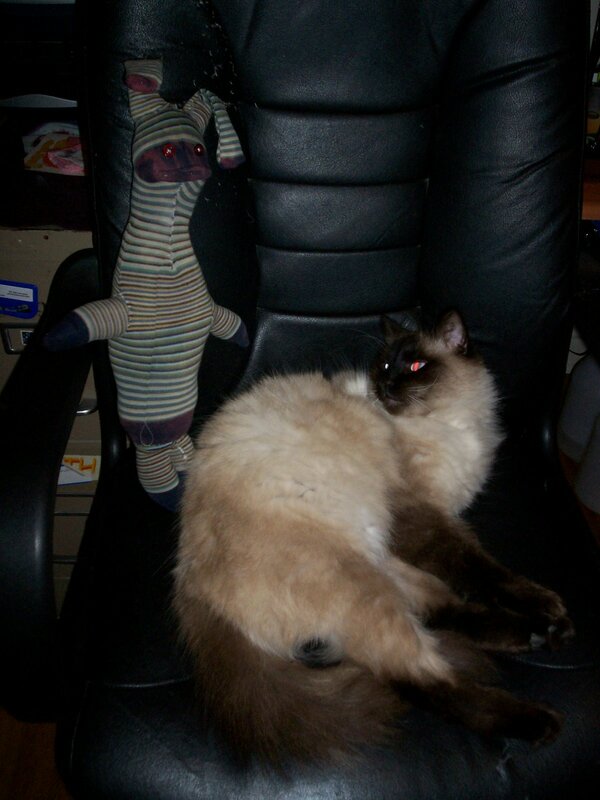 The socks creatures look as they are like real cats of different colours. Pic Frames can make anything valuable.